Shemaroo partners with DTH player to launch Miniplex on Indian dth services. 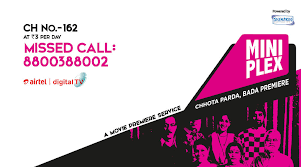 Content of the cinema business and entertainment providers Shemaroo Entertainment plans his first Movie premiere service Miniplex to start on cable and online after attaining a partnership with both DTH player Airtel digital TV and Tata Sky dth. "Direct to home TV is now a major reference platform for watching TV and Movies. Thus Shemaroo joined hands with Airtel and then with Tata Sky, and with the time, the Miniplex service on all DTH TV services," Shemaroo Entertainment Director Hiren gada told PTI. He added that the expansion plan is gradually and take three to four quarters to have a broader basis. "For the next December we need to be present on many other platforms. There are four other DTH players. There are cable operators, especially in the Phase I, Phase II aims for places or cities where digitization has already completed, "he said. The company focuses on multi-system operators (MSOs) first because they have to support the standard in terms of the number and the back-end technology platform of a payment. He said they are considering a digital distribution content platform so that Miniplex can launched on the basis of payment. Miniplex is a commercial-free movie service, where the company on every Friday shows a movie premiere in addition to showing films every week. Miniplex primarily show films in Hindi, but the company focuses on some regional content in the future. Shemaroo has a content library of over 3000 titles in your language. Digital Enterprise business has to grow at a rapid pace and accounts for about 16 percent of sales, compared to 3 per cent, four or five years ago. Last year, digital business revenue recorded of 37 million rupees and the first half of this year, more than 29 million rupees rupees generated. Digital business entails the Wireless Application Protocol (WAP) services for mobile operators, transaction models like iTunes, subscription model with the best players HOOQ and free for consumers with the advertising model like YouTube. The company has more than 40 channels on Youtube and receive about 3 million hits per day. Gada said there are no current plans of the company to launch its own dth platform.